Dr. Smith's ECG Blog: A male in his 50s with chest pain. What is your interpretation? A male in his 50s with chest pain. What is your interpretation? A male in his 50s with no significant past medical history complained of several episodes of chest pain over the course of the past 24-48 hours, which became acutely worse and persistent approximately 1 hour prior to arrival. Sinus rhythm. Normal QRS morphology with the exception of possibly high voltage. There is minimal elevation of the J point in III and aVF, with significant reciprocal ST-T depression in aVL and I, as well as ST-T depression in V2 with minimal J-point depression in V3. The large, symmetric, bulky T-waves in the inferior leads are highly suspicious for hyperacute T-waves, and this suspicion is confirmed in aVL by the massive area between the baseline and the ST-T depression/inversion compared to the QRS complex, making this definitively consistent with a reciprocal hyperacute T-wave. This ECG even without knowing the appropriate clinical history has extremely high probability of acute coronary occlusion in the inferior and posterior distributions. Additionally, there is ST elevation in V1, indicating RV involvement. The ST depression of posterior MI sometimes attenuates the ST elevation of concomitant RV MI, but in this case there is clear ST elevation in V1 even in spite of the fact that there is ST depression in V2. All findings on the presentation ECG are new compared to this baseline ECG. Specifically, notice the negative T-waves in the inferior leads with positive T-wave in aVL at baseline, which are "pseudonormalized" in the presentation ECG above. These differences again confirm acute coronary occlusion. Findings in the inferior leads are not much changed, however there is even more ST elevation in V1, confirming concomitant right ventricular MI. The ST depression is somewhat attenuated, likely because it is being caught between the anterior/rightward vector of the RV MI and the posterior vector of the posterior MI. Smith comment: We have a manuscript under consideration in which we found that ST elevation in V1 in an inferior MI is very specific for RV MI, especially when there is ST depression in V2. However, STE in V1, in inferor MI, is not sensitive enough (about 85%) to rule out RV MI. Therefore, I recommend a right sided ECG for every patient with inferior MI, unless it will delay coronary intervention. No right side ECG was recorded. Initial troponin T was undetectable. Before intervention: there is a proximal to mid RCA occlusion. The angiogram report states it was a total thrombotic occlusion with TIMI-0 flow. The tortuous vessel appears to be a right ventricular marginal branch. This is surprising because it indicates that there may not be a right ventricular infarct. On the other hand, sometimes there is a second branch to the RV. 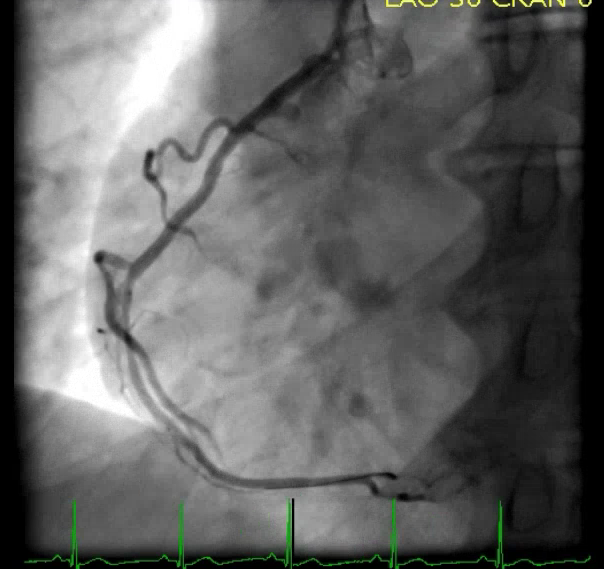 After PCI of the RCA: TIMI-3 flow through the entire RCA. Here you see a more distal branch that appears to supply the RV. Without right sided ECG, and without typical RV physiology of hypotension, and without an echo showing RV dysfunction, it is impossible to tell from the information we have whether, in fact, an RV MI was present. J-points all nearly back to baseline. There is terminal T-wave inversion in leads III and aVF, with reciprocal terminal upright T-waves in aVL and V2. This confirms reperfusion in the inferior and posterior distributions. Further T-wave changes indicating progression of reperfusion findings. Peak troponin T was 2.68 ng/mL (large MI) at approximately 12 hours from presentation. Echo showed an inferior and posterior wall motion abnormality. 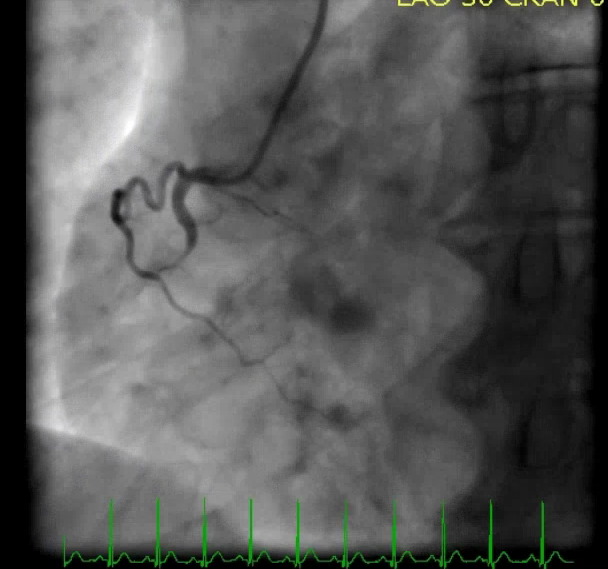 Lead aVL often has the most definitive and most easily noticeable evidence of inferior acute coronary occlusion. Serial ECGs make difficult decisions easier. Comparison with old ECG can make the diagnosis. Initial contemporary troponin within the first few hours of onset of acute coronary occlusion will usually be negative. ST elevation in V1 in the right context is indicative of acute coronary occlusion of the right ventricle, especially in the context of ST depression in lead V2. Record a right sided ECG in cases of inferior MI. I'm having trouble "seeing" the large, symmetric, bulky T-waves in the inferior leads. As well Can you explain more about what is meant by the massive area between the baseline and the ST-T depression/inversion compared to the QRS complex in aVL. Look at how straight the ST segment is in III. This results in a bulkier T-wave. In a normal lead III, the ST segment is very concave upward, that is due to less width to the base of the T-wave and is normal.